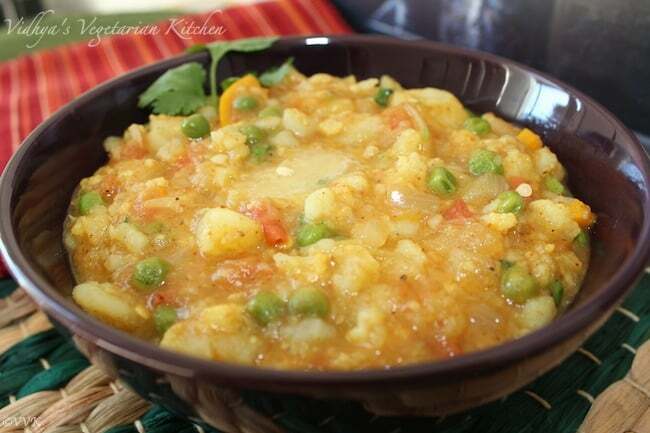 Pav Bhaji is vaandu’s favorite recipe. (Of course ours too) He can have pav bhaji for any meal. I have never been to Mumbai so haven’t got the chance of tasting the local pav bhaji but have tasted in my friend’s place and other local restaurants here in the bay. 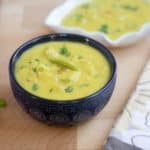 It’s easy to make, and it’s a perfect dish for the potluck or for tea time parties. 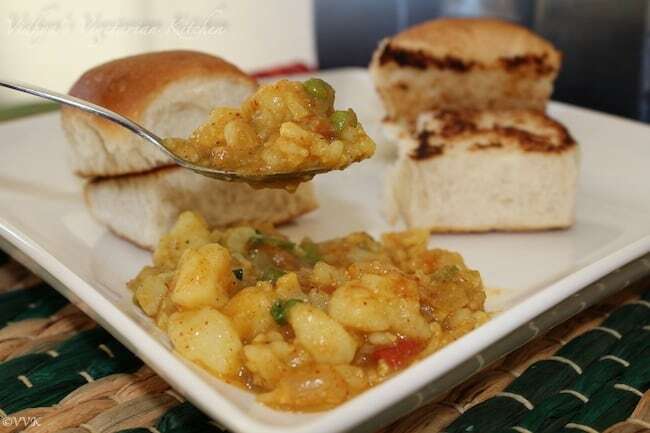 All you have to do is prepare the bhaji well ahead, and you can opt for store bought pav buns and warm them up before serving. 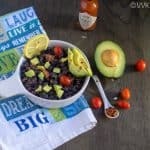 It’s a quick and easy recipe and party pleaser too. 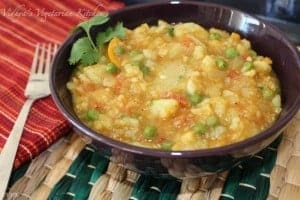 I use the store bought Pav Bhaji masala, and I use only Cauliflower and potatoes with little peas and 1/4 cup of chopped bell peppers. I don’t add any other veggies. Not sure if that’s how its made but we like this combination in our household, so I always go for this. Boil the potatoes and mash them roughly. Now heat the kadai and add one tsp of oil. Once the oil is hot add the cumin seeds. As they start to crackle add the ginger garlic paste. Cook till the raw smell goes and then add the chopped onions. Once the onion turns translucent add the chopped tomatoes. Add salt, turmeric powder and pav bhaji masala and cover and cook till the tomatoes are soft and mushy. Now add all the veggies and add 1 cup of water and cover and cook for 5 minutes till the cauliflower becomes tender. Add the sugar and using a potato masher, mash all the veggies and bring it along together. Let it boil for a couple of minutes and that’s it. Add the butter and serve it hot with the pav. Adding sugar is just my preference. It is completely optional. Also, you can cook the potatoes along with veggies. I usually boil them before so that it speeds up my cooking process. I usually microwave my potatoes but if you are using pressure cooker the preparation time might vary. Now heat the kadai and add 1 tsp of oil. Let it boil for couple of minutes and thats it. Adding sugar is just my preference. It completely optional. Also you can cook the potatoes along with veggies. I usually boil them before so that it speeds up my cooking process. That is one popular and delicious combo you have got there. Love it. Love pav bhaji a lot. You have reminded me that I have not made it in ages. Such a classic dish from Mumbai. 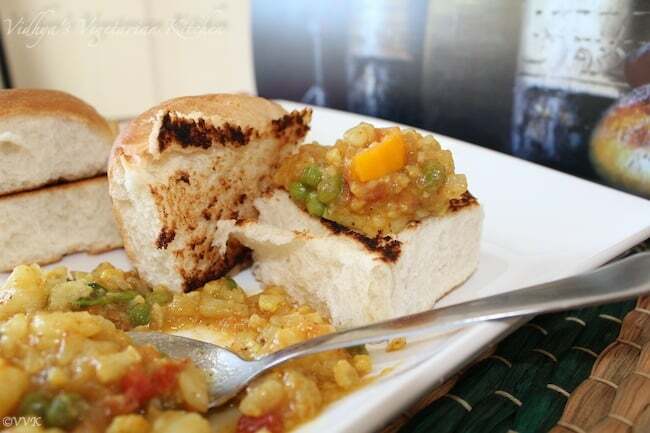 Your pav bhaji looks yummy. 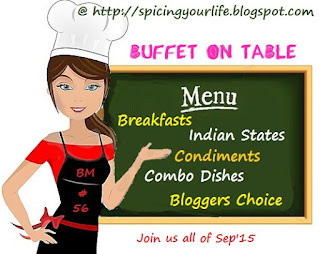 Very nice presentation..I love Pav bhaji..
Our family fav too.. 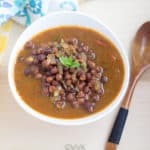 Loved your version of bhaji..
Our fav go-to dinner these days. My all time favourite, just can take my eyes from ur spread.. Delicious wish I could get that plate to have the pav bhaji now. :-) :-) Are you making it? 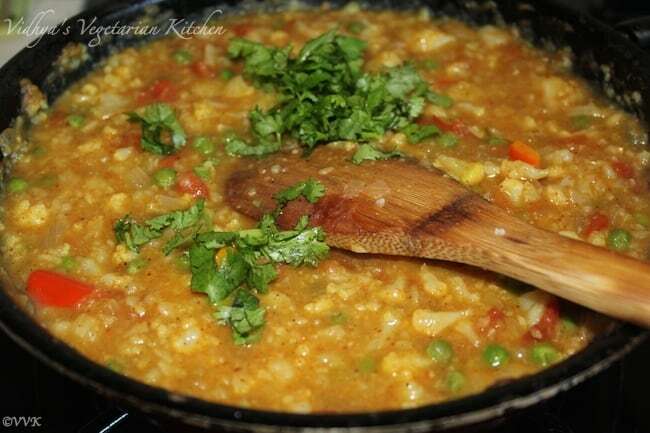 I love pav bhaji and your pictures tempted me to make some now. Every one has their own way of making Pav Bhaji . 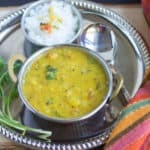 This is one special Maharashtrian dish which is relished by all. Though I have eaten Pav Bhaji many times at various places, never taste it in Bombay during my few trips to the city.